Dallas Drinks is a co-creation with Dallas Decoder, honoring the characters of the TNT drama Dallas, which continues the Ewing family saga. See all of the Dallas Drinks here. Monday is the mid-season finale of TNT's Dallas before the show breaks until its return in the summer, when the final seven episodes of the third season will air. Dallas Decoder and I are in such suspense over this season. Will John Ross seize total control of Ewing Global? Will Sue Ellen regain her sobriety? How will Pamela react to finding out about her husband's extramarital liaisons with Emma? So many questions! I'm sure some will be answered Monday, but certainly others will linger while new ones emerge. This is Dallas after all, the show that made cliffhangers a prime-time staple. 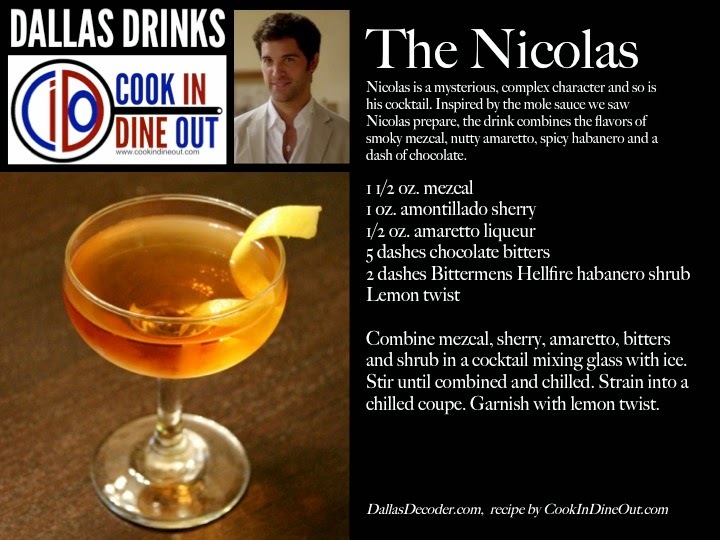 To celebrate next week's episode, Dallas Decoder and I have teamed up for another Dallas Drink, this one inspired by season 3's new regular, Nicolas Treviño, played by the dashing Juan Pablo Di Pace. Nicolas is a mysterious, complex character and so is his drink. Inspired by the mole sauce we saw Nicolas prepare this season, the drink combines the flavors of smoky mezcal, nutty amaretto, spicy habanero and a dash of chocolate. We think Nicolas is irresistible; we hope you agree this drink is too. And speaking of smoky, the upcoming episode is titled "Where There's Smoke." You can watch Dallas Monday night at 9 p.m. EDT (8 p.m. CDT) on TNT. It's sure to be a hot one! Combine mezcal, sherry, amaretto, bitters and shrub in a cocktail mixing glass with ice. Stir until combined and chilled. Strain into a chilled coupe. Garnish with lemon twist. This drink is worthy of the mysterious Mr. Trevino. Thanks for creating it. We should have them during tonight's midseason cliffhanger.